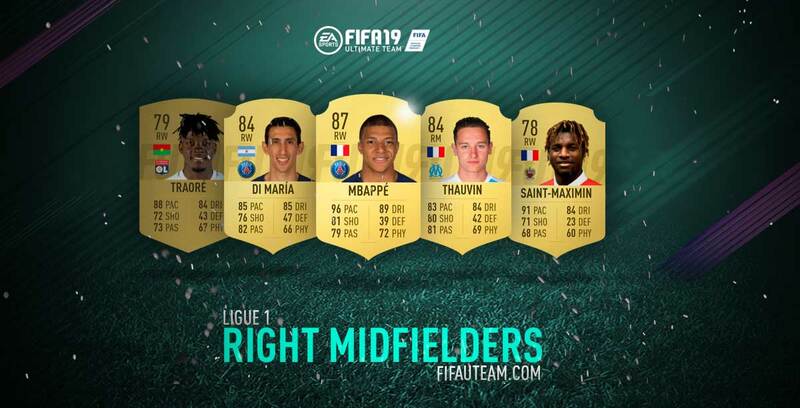 Who are the best FIFA 19 Ligue 1 midfielders? Let’s find out good defensive, centre and attacking midfielders, as well as right and left wingers, to your team! 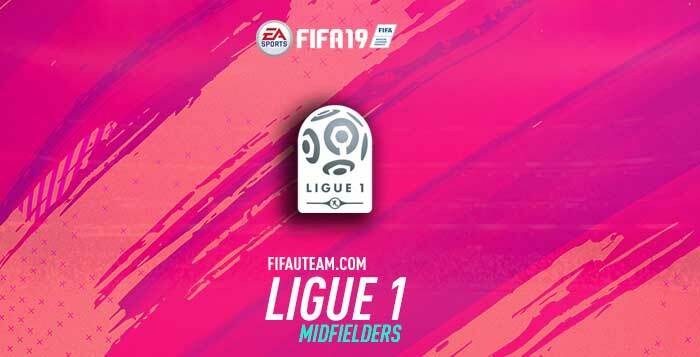 Many of the FIFA 19 Ultimate Team formations require some midfielders that have a natural aptitude to defend. Central defensive midfielders distinguish themselves for being especially aimed to help the more retreated line of their teams. According to their attributes and their work rates, they can also be useful for starting attacks. They are players that occupy a very strategic position in the field. Luiz Gustavo is clearly the most popular central defensive midfielder in Ligue 1. There are a variety of attributes in a central defensive midfielder that you have to give attention: defending, so that the first defender of team works; strength, so that you win all brawls in a prone area of the field; heading, to win possession in aerial moves like goal kicks; pace, so that you cover the most terrain on the field as possible; stamina, so they can equally participate in offensive and defensive moves (especially useful for players with high/high work rates); passing and possession so that he can properly start attacks. In our opinion the two first are the most important. Normally using a central defensive midfielder is associated with having a deficit of elements in your defence. So, it makes sense that when you search for a player to occupy this position you’d want players that can defend. Luiz Gustavo is a really good choice for teams that want to complicate an opponent’s game in the space between the midfield and the defence. The area of the field occupied by the central defensive midfielders is the one where most ball disputes happen. Strong players will have a higher probability of winning the ball. Tousart is one of the best on this side. There are no good options for this position in the French league. 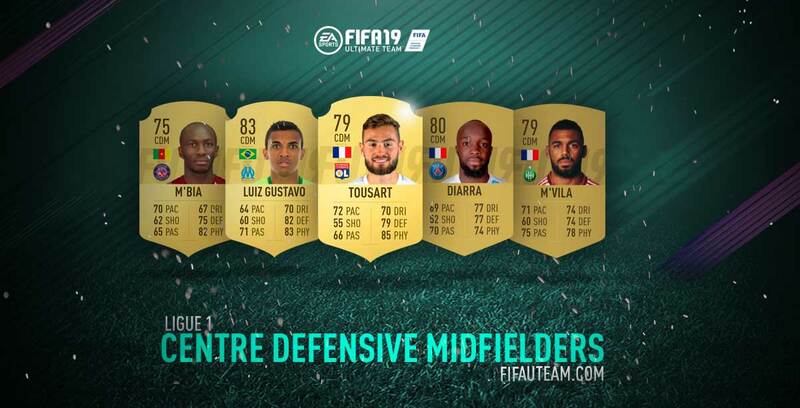 Tousart and Luiz Gustavo looks to be the best ones but, if you want someone ready to start the attack, then it’s Diarra who you should choose. A lot of games are decided in the midfield and not close to the goals. The players that play in these zones are the ones that should create the game and define its rhythm. Verratti is the most popular centre midfielder in this league. Centre midfielders are responsible for discovering lines that break the opponents defence. Their passing quality has to be really good so they can assist forwards. Marco Verratti has a great passing stat. A Centre midfielder usually needs creativity. Good dribbling allows the team to move forward, creating potential disequilibrium’s. 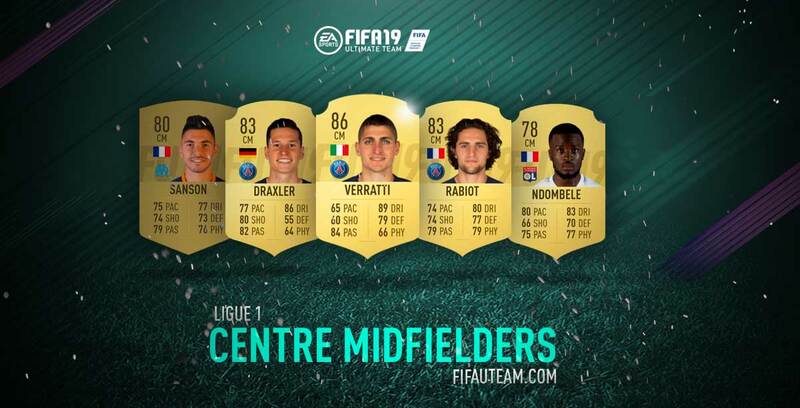 Once again, Marco Verratti is the best dribbler playing on the Ligue 1. Verratti is the best one in the most important attributes, passing and dribbling, but also in the defensive ones. He is our first choice for this position. There are also decent options that are available at a cheap price who are still good quality-wise, like Draxler, Rabiot and Sanson. An attacking centre midfielder is responsible for creating chances to score. He should have a good dribbling, a decent passing, a high long shot stat and a great vision. Fékir and Payet are, by far, the most popular CAMs of this league. How we explained, the central attacking midfielders need to have good passing stats, so they can assist forwards. Payet is the CAM with best passing stat in France. If a CAM is a good dribbler, he can make all the difference when the team is attacking. 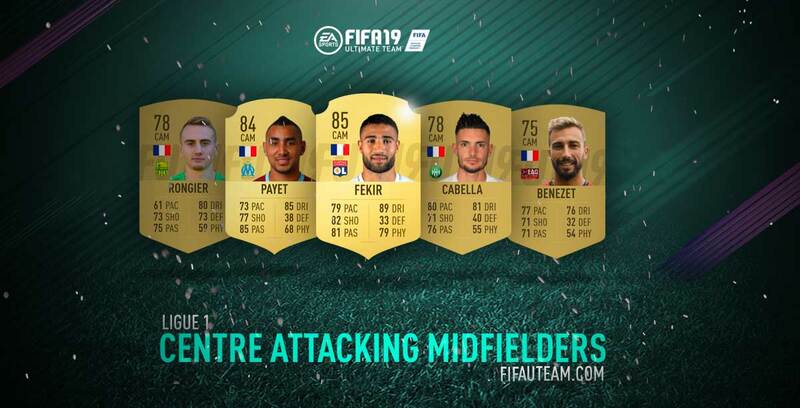 Nabil Fekir is the best dribbler. Fékir and Payet are much better than the other CAMs of Ligue 1. Only Cabella can be used as alternative to them. The wingers are responsible for giving game width in the attack. They’re normally very explosive players. There are several good righ wingers on this league, like Mbappé or Di Maria. There are three fundamental attributes for a winger: pace, dribbling and passing. Pace is probably the biggest weapon of these players. They use it to evade opponents and getting to the other side, many times via sprints on the side lines. Just being fast doesn’t cut it to reach the opponents box, having good dribbling to surpass the opponents’ players that appear on the way. There are a lot of players gifted in dribbling, being Mbappé the best. When reaching the opponents box the winger has to decide what to do. Normally, they choose to cross to the forwards. That is why it’s important for them to have good passing. Di María has the best passing stat. To us, and probably to everyone, it is extremely easy to choose the best right winger from Ligue 1: Mbappé. He has the best pace, shooting, dribbling and physicality stats. There are also good options that are available at a cheap price who are still good quality-wise, like Di María or even Thauvin. The left wingers have exactly the same role as their team mates from the other side. Neymar, the most expensive player in football history, is obviously the most popular on Ligue 1. Sarr the fastest left winger. 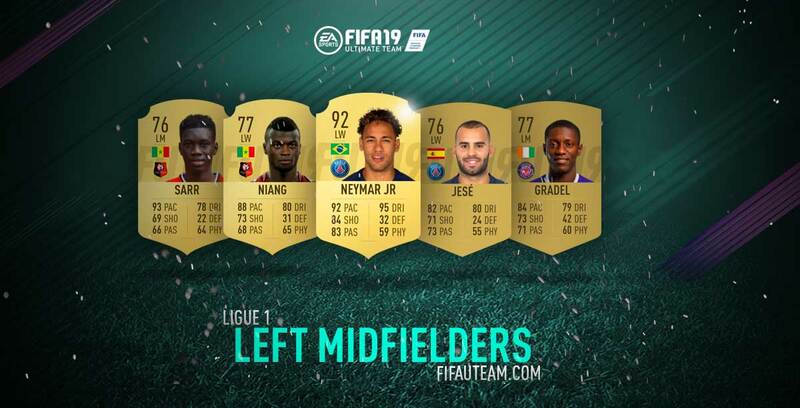 Neymar is clearly the most highlighted left winger of Ligue 1 in this chapter. Neymar has a much higher passing stat than any other LM of this league. Neymar is clearly the best left winger. He is the one with the best passing, dribbling and shooting stats. If you can not pay his price, then you are in trouble because there are no other quality left winger on this league.